Tugging is a popular activity for many dogs and their owners. It may be done to initiate enthusiasm, to increase muscle strength, used as a positive reward, or to just plain old have fun. I have seen dogs calmly play tug and dogs tug with so much gusto their owners could barely stay on the ground. If done correctly, tugging can be a safe and effective way of increasing strength in the body core and hindlimbs, as well as the cervical region. When tugging with our dogs, it’s important to make sure we are not causing any harm. Emphasis should be on keeping the dog’s spine in a neutral position. A neutral spine does not involve extreme extension. We will want to keep the neck even with the floor or even looking down. Tugging with the dog in a level position will involve a significant amount of core work, as well as work to the hamstrings and gluteals. Hamstring strength is important in dogs with cranial cruciate disease (ACL, CCL) or very straight stifles. Gluteal strength is important in any dog that performs jumping or running activities. If possible, I like to sit on a stool or the ground and hold onto the tug toy. Sitting on the floor or on a stool will not only help your posture, it will also prevent the dog from pulling too far up with their neck. If you have a small breed, you will need to lower your body or arm to their eye level. Another form of tugging is to place the tug on the ground and ask the dog to tug up. I like to place the tug under my foot and and have the dog pull in an upward motion. The abdominals and forelimbs will be very active during this motion and this is an excellent activity for strengthening these areas. This type of activity is very useful for dogs involved in jumping and landing as it focuses on the strength in the large forelimb muscles. The forelimbs need stability when landing from a jump. Increasing this through dynamic tugging is important. Abdominal strength is key to stabilizing the spinal region. Tugging with the head up and neck or cervical region in a very extended position can place a significant amount of stress on the neck and jaw. I have seen dogs actually flying around while tugging. This movement can stress the cervical spine as well as complicate the small facet joints of the neck. 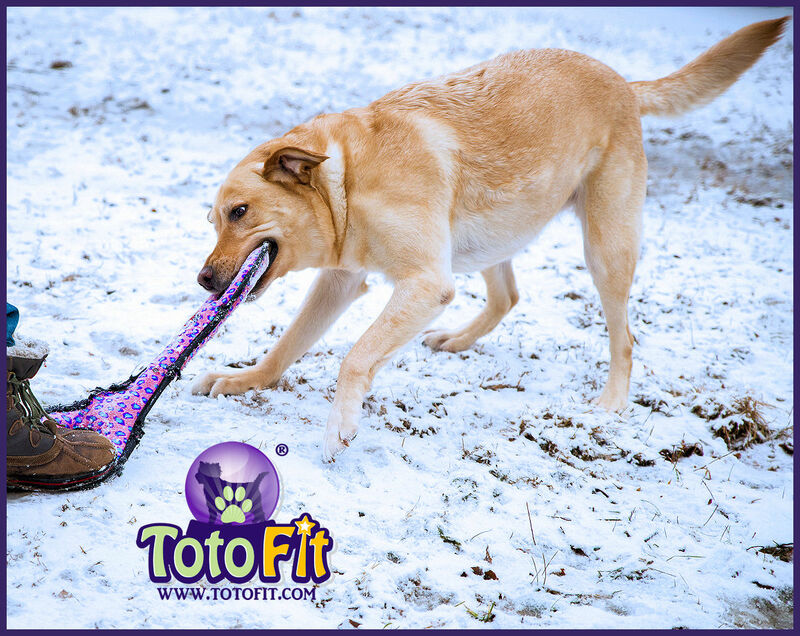 If your dog has always enjoyed tugging but suddenly avoids the activity and/or releases the tug suddenly, you should explore the possibility of a physical issue. Things to look for would be any spinal pain, TMJ (jaw) pain or problems with the mouth, teeth or throat. 1. Keep the dog’s neck in a neutral position, never extended up or down. 2. Start with short sessions and gradually increase time. 3. Provide consistent tension for the dog to tug against (do not yank the dog back and forth). 4. Increase the challenge by having the dog stand on an unstable and/or uneven surface. Our #TotoFit Infinities and Disks work great for this. 5. Always make sure your dog is cleared for exercise by a veterinarian before starting any conditioning program. Excellent information! Have shared to my clinic FB page. Thanks so much for keeping us all in the know.